Habit: Catopsis berteroniana grows without discernible stems up to 50 cm (excluding inflorescence) in height. The bright, light, green leaves are in a rosette forming a series of cups at their base that can hold water and detritus. The leaves are parallel veined, lanceolate, to 6 cm wide at the base and 0.5 m in length and covered with a white chalky powder. The actinomorphic flowers, each with a subtending bract, are arranged in a bipinnate-spike that is 2 -4 times the length of the leaves. The lower bracts are leaf like while the upper are tightly appressed to the peduncle. There are 3 green unfused sepals in the calyx that exceed the length of the bracts. There are 3 green unfused petals in the corolla. There are 6 stamens that are shorter than the petals. The ovary is superior with 3 locules and numerous seeds. The fruit is a capsule that is equal in length to the sepals. Each seed has a tuft of hair to assist in dispersal. Habitat: Catopsis berteroniana grows as an epiphyte on trees and shrubs in mangrove and fresh water wetlands as well as very wet coppices. 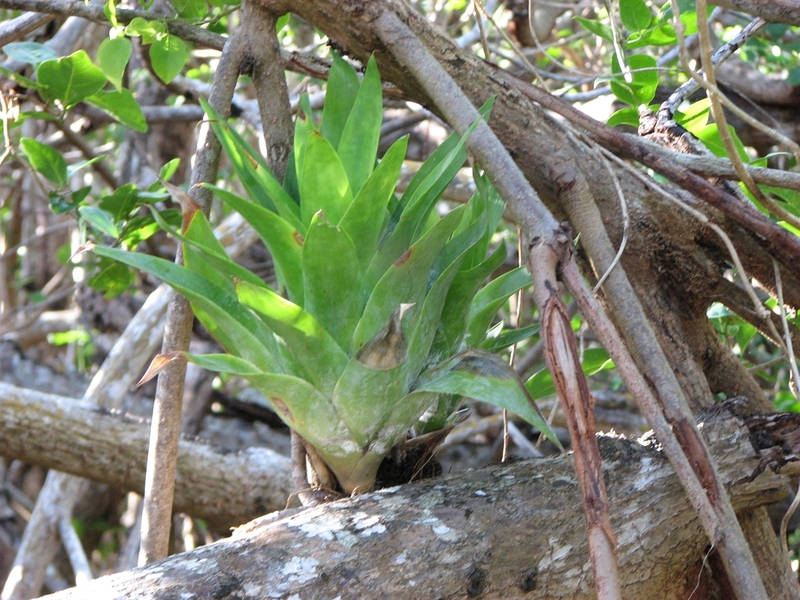 Distribution in Bahamas/Globally: Catopsis berteroniana is known to occur on New Providence and Andros islands (likely on Grand Bahama and Abaco) in the Bahamian Archipelgo as well as Florida, the Caribbean region and Central America South to northern South America. 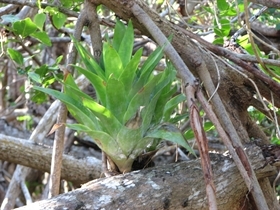 Medicinal/Cultural/Economic usage: Catopsis berteroniana is not used medicinally in the Bahamas.